_____ We are excited to announce that following the very successful release of the California Zephyr, comes the "Super Chief." 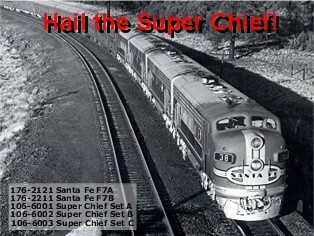 It will be available in individual F7A and F7B locomotive units and three different 4-car passenger car sets, so that you can enjoy operating this well-known Santa Fe train while incrementally adding locomotives and cars to eventually build your train into the complete 1953 weekend "Super Chief" consist. Equipped with KATO magnetic knuckle couplers. Locomotives will feature directional LED headlight. Locomotives will be DCC friendly. includes kits for 6 standard passenger cars or cabooses. some dome cars may require two lights per car. If you find items of interest you may contact me via email and I will gladly assist you.